We’re well behind on blogs, again. Raising a litter of puppies really is a full-time job, and then some! 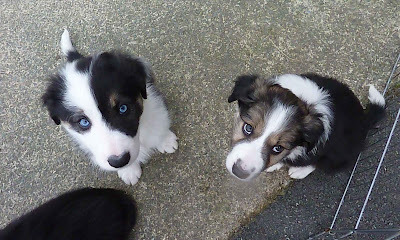 Two Jubilee Puppies left for their new homes at the weekend, same family, different households. Little Miss Tan Cheeks and brother Ol’ Blue Eyes were able to travel on their 350 mile journey to new homes together. Then there were just three remaining. 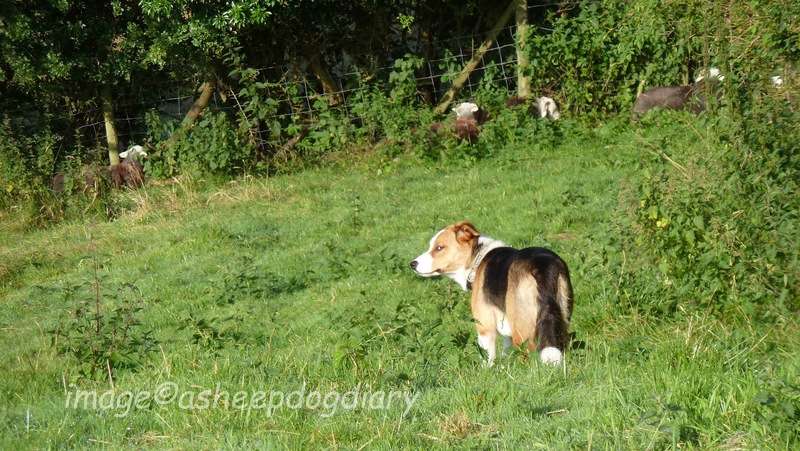 As pups leave there’s a short period of ‘quiet’ from the other pups as they re-adjust. It didn’t take long for this little group to re-form and start causing havoc again! 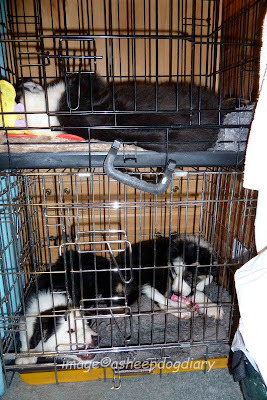 Now down to three puppies I’m able to bring them all into my bedroom to start them off with overnight crate training, an important part of preparing pups to leave for their new homes. Overnight crate training can be a little stressful, to human and to pup, if not done correctly ... if there are going to be any objections I want them to take place with me so that I can get the puppies through it. 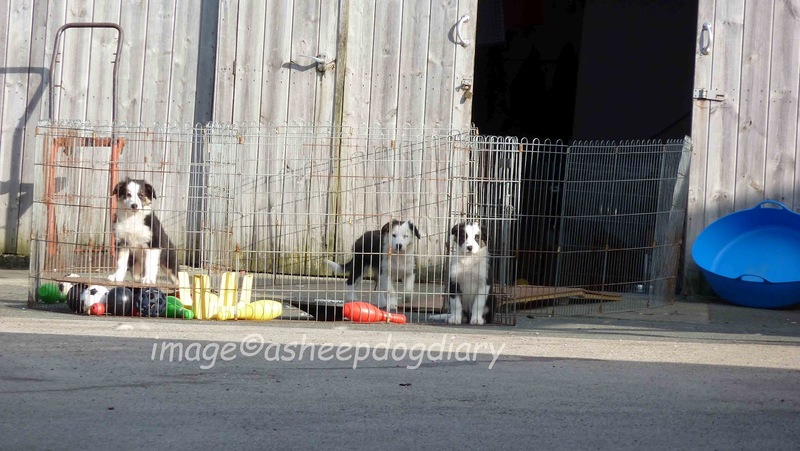 I also want to be able to tell new owners when they may expect to have to get up in the night, if in fact they do, in order to take pup out for wees - an overnight crate = bed = no toiletting in this area! Two pups in one crate, the next pup to leave home now starts solo time. As you can see, Little Spot is quite settled. A minute or so after going into her crate she is totally zonked out. They are being brilliant overnight, sleeping a good six or seven hours before needing to toilet. Wont take much time before they’re going right through the night. Today we woke to a fantastic morning, but to a loud roaring sound ... on further investigation we found an early morning balloonist taking advantage of the good weather. 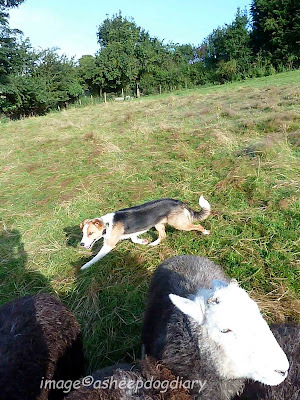 Pocket Rocket managed to go missing whilst photographing the balloon, I found her having a chat with my Herdwick Boys down the field. "Uh oh, I've been rumbled"
So, an early morning sheep training session ensued at 6.30am - me still in jim jams and slippers!! She did work very well, really pleased with her, just wish she’d waited until I was dressed and fully awake! 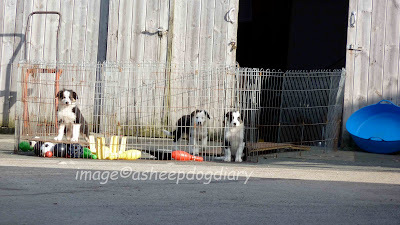 On returning to the ‘yard’ the pups were plotting their activities for the day, and enjoyed catching the early morning sun whilst they did so. 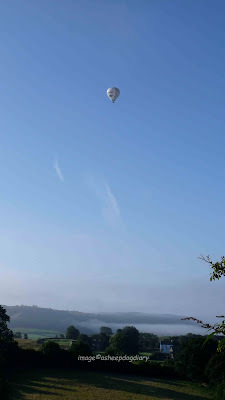 A jolly jaunt out in the Collie Mobile in the morning was followed by paddling pool fun in the afternoon. I’m making the most of the three remaining pups. Not be long until they’ve all left for their new lives.